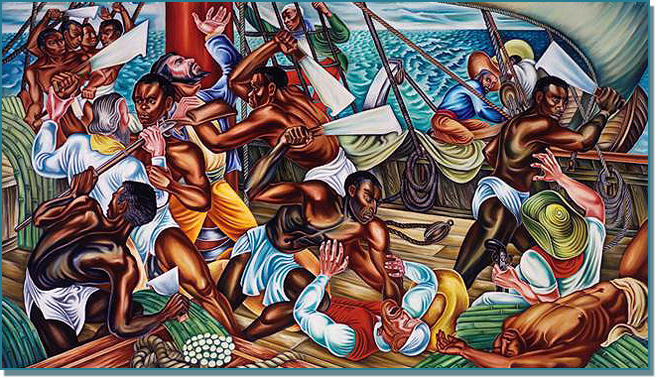 Mutiny on the Amistad (1939), mural at Talladega College, Alabama, by American artist Hale Woodruff (1900–1980). Image from African Art World. Born into slavery in Kentucky two hundred years ago, William Wells Brown fled to Canada when he was only nineteen. Within a decade after his escape, he married, moved to Buffalo, raised three daughters (one of whom died), provided aid to other fugitive slaves, worked as a sailor on Lake Erie, became president of a local temperance society and a lecturer for the Western New York Anti-Slavery Society, and—perhaps most important—taught himself to read and write. 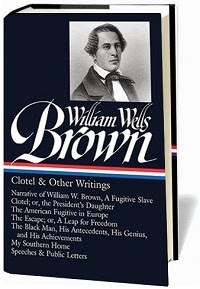 In 1847 he published Narrative of William W. Brown, A Fugitive Slave, which sold so many copies that four printings were required in less than two years. After his initial success as an author, Brown published many other books, including a series of firsts. In 1852 he published Three Years in Europe, the first travelogue by an African American; an expanded edition, The American Fugitive in Europe, appeared three year later. Clotel; or, the President’s Daughter is the first novel written by an African American. Published in 1853, it is an imagined history of Thomas Jefferson’s black daughters and granddaughters. The Escape; or, A Leap for Freedom, the first play published by an African American, appeared five years later and portrays a slave woman’s escape from the sexual aggression of her white master. In 1862 he finished The Black Man, His Antecedents, His Genius, and His Achievements, which contains fifty-seven biographical profiles, including such prominent figures as Toussaint L’Ouverture, Alexandre Dumas, Phillis Wheatley, Frederick Douglass—and the mutineer Madison Washington. The revolt on the brig Creole, according to the late historian Don E. Fehrenbacher, was “the most successful slave rebellion in American history, achieved with British collaboration”; 135 men and women were freed, and Washington was their ringleader. (By comparison, the far more famous Amistad mutiny two years earlier freed 53 slaves.) Not much is known about Washington’s life before or after the mutiny, and even the presence of his wife on the Creole (described in Brown’s account) is an almost certainly apocryphal addition that first appeared in an article in The Liberator the year after the mutiny. Frederick Douglass’s only work of fiction, the novella The Heroic Slave, is also based on the life of Madison Washington. Brown’s account omits much of what happened after the Creole arrived in the Bahamas. The nineteen mutineers were imprisoned by local authorities, while the remaining slaves were released and given their freedom. Two months later a British court ruled that the prisoners should also be freed. In the early 1850s the British and American governments agreed to a treaty compensating the slave-owners for their losses. Note: The quote on page 509 is from Shakespeare’s Richard III. Among the great number of fugitive slaves who arrived in Canada towards the close of the year 1840, was one whose tall figure, firm step, and piercing eye attracted at once the attention of all who beheld him. . . . If you don't see the full selection below, click here (PDF) or click here (Google Docs) to read it—free!